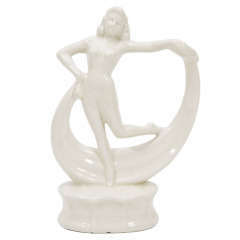 This Art Deco sculpture was realized in the United States, circa 1930. It features a perfectly proportioned male figure wearing gladiator sandals; a flowing robe; and a loin cloth- all in silvered bronze. He holds a scroll in his left hand, while his right hand is stretched towards the sky gripping a small bunch of olive branches in his palm. He stands on a platform composed of diametrically opposed wings with an acanthus leaf detail in the center all of which rests on a skyscraper style domed circular base. 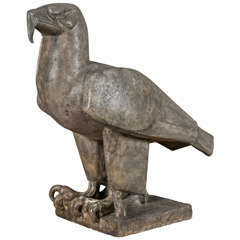 The sculpture is presented on a volumetric rectangular exotic Belgian black marble pedestal. With its classically inspired form and beautiful artisanal construction, this piece is sure to delight discerning collectors of the period. It would be a winning addition to any side table or etagere. Excellent condition. 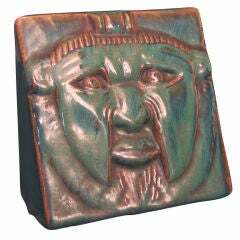 American, circa 1930 Dimensions: 17" H x 7" W x 3" D.
Figurative, Art Deco, wall sconce features a gypsum facial sculpture with a lovely antique patina, back-lit against a steel convex disc. 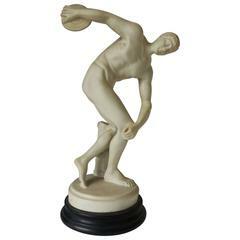 An Art Deco reproduction piece of the male Greek sculpture Discobolus. Sculpture stands 17 inches tall. 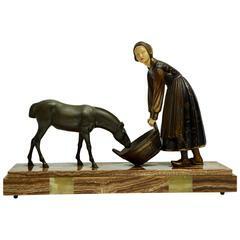 Art Deco sculpture of a woman with a drinking horse. Height;37 cm. Width:51 cm. Depth:15 cm. Art Deco sculpture of two deer. Measures: Width 75 cm. height 38 cm. Weight 17 kg.